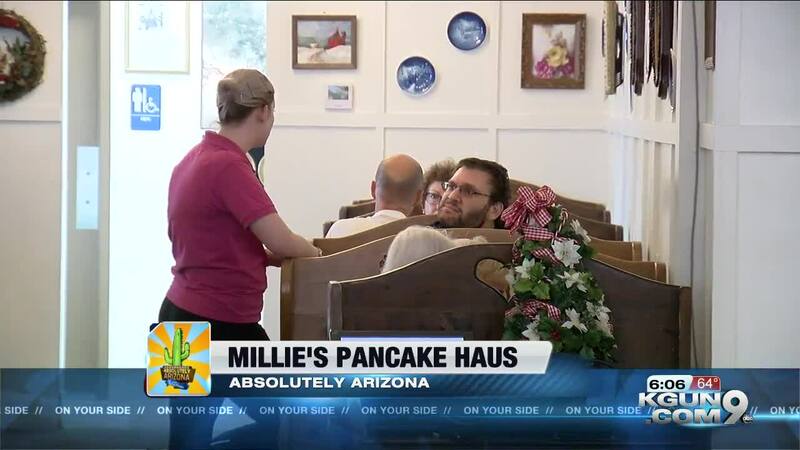 TUCSON, Ariz. -- Tucsonans have been flipping over Millie's Pancakes since 1982. The east side breakfast and lunch tradition hasn't changed over the last 37 years, even if the ownership has. Owner Dean Griffith says, "why would I mess with this?" Millie's Pancake Haus was originally started by Mildred Novack. She retired to Tucson, and opened Millie's on Tanque Verde back in 1982. She used the same pancake and waffle recipes she became famous for at her restaurants in the upper Midwest. A few years later, Mildred sold Millie's to Beverly and Warren Whitmer. That's where Griffith comes in. "When I needed a job, she was here for me. When she needed somebody, I did my best to be there for her," remembers Griffith. In 2011, after Beverly's death, Griffith bought Millie's without any changes or fanfare. That's because, he says, "you can't just barge in and say I'm changing this and I'm changing that. It doesn't work. The customers will panic, they will complain, they won't come back." That's why Griffith still uses Millie's family recipes for the famous homemade syrups, potato pancakes, the waffle batter, and of course, the buttermilk pancakes. But, there was one major change at Millie's: the location. After 36 years on the south side of Tanque Verde, Millie's moved to the north side into Trail Dust Town. They took over the location where Dakota Cafe used to be. Despite the new location, inside of Millie's you'll find all of the knick-knacks are still there. You get the sense that Millie's really fits the atmosphere in Trail Dust Town. The size of the restaurant feels bigger inside, even though there is less seating than the old location. But, there is one major upgrade: the kitchen. "Brand new facility and a brand new kitchen. We're still trying to learn our way around here. We do make everything we can from scratch here. The buttermilk batter, the waffle batter," says Griffith. The addition of more grills and kitchen space means the jam ups at the old location, are a thing of the past. Griffith says pancakes, omelettes, french toast, potato pancakes and more were all being made on half of the grill. He says, "half the menu was coming off of that side of the grill." While there are about 30 less seats in the new location, the kitchen's efficiency means far less waiting for customers. Plus, with added outside seating, that means less waiting for canines too! Now, in it's 37th year in Tucson, Millie's continues to be delicious and Absolutely Arizona.